Footprints first opened in Ann Arbor in 1977 in a small corner of the old VFW hall on Liberty street at the front of the Natural Foods grocery and restaurant, Soybean Cellars. Birkenstocks had been sold in the grocery beginning in 1973, with Shakti shoes added as Footprints took on its own identity. Footprints' owner, John, had been the first employee of the Kalso Earth shoe store located near Kerrytown in 1972. The store outgrew this space and moved to a larger storefront in the same block of Liberty in 1979. Footprints in Royal Oak opened in 1980 to meet the needs of the progressive community there seeking the comfort and style of our product line. From the outset, this location was established under the continuing inspiration and guidance of Adele R. With a downturn in the Detroit area economy, we had to close this shop in 2014. The U of M campus store on South University opened in 1992. This location carries brands and styles that appeal to the younger student population. The skateboard shop, Launch, opened in 2001 on the lower level of Footprints with a great selection of skate shoes, boards and apparel. Launch Board Shop was forced to move to it's new location o Packard St. in early 2017 with major reconstruction of HiRise buildings taking over South University. Launch always had the worst of Ann Arbor parking problems on South U, but now parking is simple, and no cost at the Packard St. location between Banfield's Grill and Batteries Plus. 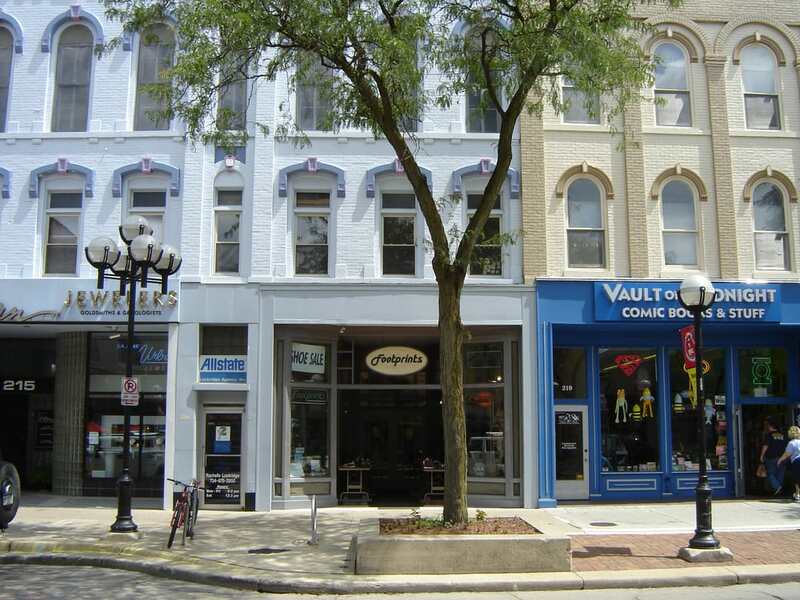 In 1997, an opportunity arose for Footprints to open a storefront on Main St. and become downtown Ann Arbor's premier shoe shop. Where Footprints was only 1 of 12 shoe stores in 1977 downtown, now we are proud to say that we have become one of only a handful of full service shoe stores remaining in downtown Ann Arbor. Come and try on our vision!